BRYAN EATON/Staff Photo. Area schools were closed for the late season snowstorm yesterday which dumped about four inches of snow. 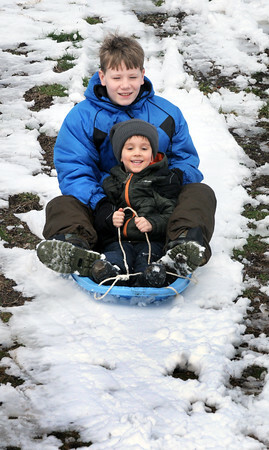 Brothers Mark Chassen, 11, and Damon Gavin, 3, of Newburyport took their sled to March's Hill in Newburyport with dozens of other youngsters.